New York Comic Con Afterthoughts: It Keeps Getting Bigger and Better! Editor’s Note: In this column animation critic Joe Strike gives us an overview into his adventures running around the New York Comic Con this past weekend. This damn thing keeps getting bigger and bigger, not that that should be a surprise to anyone. The only surprise is why did it take so long for NYC to get a world-class con of its own. 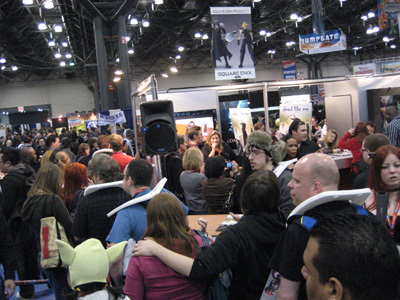 When the New York Comic Con opened for business in ’06, four years ago, its exhibit area was a tiny (for the massive Javits Center) basement space that was overcrowded from almost the instant the con opened its doors. This year the exhibitors took over most of the high-ceilinged main floor, an enormous space that the equally pop-culturey Licensing Show used to fill before moving to Las Vegas. 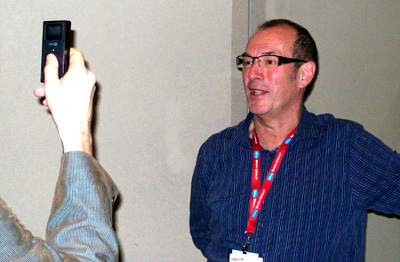 Meanwhile, downstairs in the panel rooms author and superstar graphic designer Chip Kidd regaled his audience with images from Bat-Manga, an unearthed collection of forgotten Batman adventures licensed by DC, created and distributed exclusively in Japan for manga fans. Kidd began his session by throwing his audience a curve: excerpts from one of the first anime imports, the 1960s’ wonderfully tacky Eighth Man series; turns out a particularly dynamic handful of Batman’s manga stories were the work of the series’ creator Jiro Kuwata. 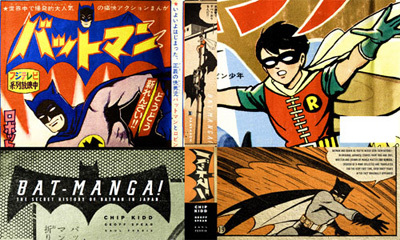 Pronouncing this version of Batman as “the first convergence of Japanese and U.S. pop culture,” Kidd treated his audience to translated, dynamically composed panels from the stories. Images of bizarre Japanese Bat-merchandise followed, including a baby Batman mask and a toy Batman tank, which Kidd noted preceded the one used by the caped crusader twenty years later in Frank Miller’s Dark Knight graphic novel. If you want to ask a question at a popular session it’s wise to sit as close as possible to the microphone in the aisle – like in the same row of seats. 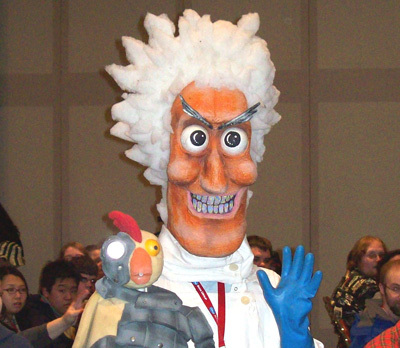 Even so, by the time I reached the mic at the Robot Chicken panel I was second in line, but a few moments later at least 20 people were standing behind me. I’ve always been suspicious of officially-sanctioned parodies from the moment I realized movie studios let Mad Magazine advance-screen their films in the hope that the Mad spoof would be on the stands the same week the movie opened. I mean, is ‘authorized parody’ an oxymoron or not? (Just saw my first Watchmen TV commercial a few moments ago, on Comedy Central just before Stewart…) Unless you were willing to stand on a two-hour line, the screening of Watchmen excerpts was impossible to attend; Watchmen: Portrait of a Movie was a far easier ticket. Over the course of the film’s 100-plus day shoot, Clay Enos became more than the on-set still photographer: all the photographs shown within the movie were taken by Enos, including a group shot of the 1940’s Watchmen, which Watchmen artist Dave Gibbons said “sent shivers down my spine… it so perfectly captured the Golden Age superhero feel.” Gibbons shared his thoughts as to his creative choices in constructing Watchmen World: nine-panel page layouts a la Harvey Kurtzman and Steve Ditko… the use of secondary rather than primary colors… and the absence of onomatopoeic sound effects – all with the goal of grounding the novel in as non-glamorous, anti-superheroic world as possible. All told, Enos shot some 45,000 pictures, including Richard Avedon/Diane Arbus-type black and white, unsparing (ie, every pore disquietingly visible) close-up portraits of the film’s cast and crew (and a number of its props) posing against stark white backdrops. The pix have been published as Watchmen Portraits, an oversized and rather heavy $50 coffee table book that if nothing else, proves this is a drop-dead serious movie; hell, I’m sure Warners is kicking themselves for not thinking of doing the same thing for Dark Knight. 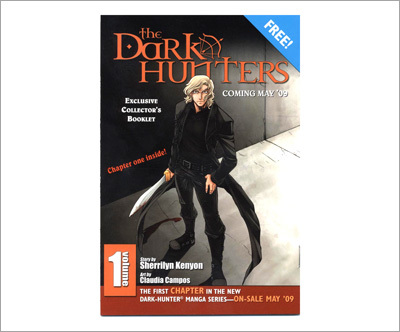 And speaking of ‘Dark’ characters, any comics publisher giving away a mini-version of its manga-style Dark Hunters comic should think twice before picking a typeface that makes its title look like ‘Dork Hunters’ from a distance; one might get the mistaken impression they’re belittling the Comic Con’s attendees.